John Young Parkway is a major arterial route leading north from Kissimmee to Orlando. North from the Osceola County line, the commuter route passes through Hunter's Creek and other south Orange County suburbs to Center Florida Parkway. Designated as County Road 423, the arterial transitions from a residential route to a commercial route, passing through the Southpark retail area, Orlando Central Park and Oak Ridge. John Young Parkway enters Orlando briefly at the Park Central, before reentering unincorporated Orange County ahead of Lake Catherine and Interstate 4. The northernmost 2.3 miles of the 18.4-mile long County Road 423 takes a winding course through Orlando between Clear Lake and Lake Sunset. State Road 423 extends John Young Parkway north from Church Street in Orlando to U.S. 441 (Orange Blossom Trail) at Lee Road and SR 434 (Forest City Road). The $75.8 million expansion of SR 482 (Sand Lake Road) from International Drive east to Florida's Turnpike includes the construction of a single point urban interchange (SPUI) with John Young Parkway. Work on the flyover for CR 423 - Project 407143-6 started on October 14, 2016. Estimated completion is spring 2020. L.B. McLeod Road east at CR 423 (John Young Parkway) by the exchange with Interstate 4 at Catalina in Orlando. Photo taken 01/13/14. 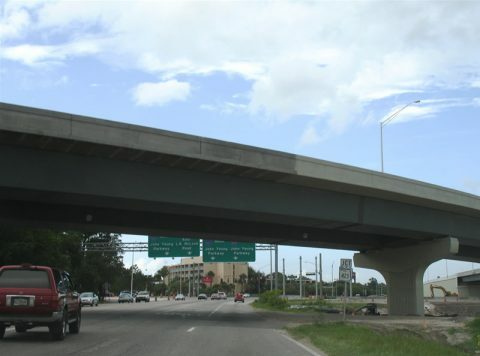 "Rising above I-4 crowds - Flyover exit will move traffic at John Young Parkway." Orlando Sentinel, The (FL), April 26, 2006.